It almost sounds like a horror movie, well it could well be if you get them on your roses. The large Rose sawfly, Arge pagana, has really increased over the last couple of years and is becoming a real problem on roses. This beautiful insect gets its name sawfly by the way it lays its eggs, it has a sawlike egg laying dagger that it uses to cut into the rose stems to lay its eggs, these cuts can be from 25mm to 75mm in length and it&apos;s quite amazing to watch it. Once the eggs are laid, they hatch quite quickly into caperpillers. These little beasts are again pretty obvious compared to other caterpillars. If you get near them, they stick their bodies out trying to look like the veins on a chewed leave, if that doesn&apos;t work, its next trick is to fall to the ground and once safe, the crafty little so and so&apos;s, then climb back up the plant once the danger has gone! Don&apos;t let that fool you though, they will strip your rose bare of leaves faster than you can believe and having up to 3 broods a year, well worth looking out for their tale tell signs of the scar on the young stems on the roses. Treatment is pretty easy on smaller roses, if you notice the cut lines in time, just cut out the damaged section and add to the green bin or rubbish bags. If they have hatched into hungry caterpillars, place your hand underneath to catch any that will drop off the plant and just squash them in your fingers! If you are a little Squeamish, best way is to put a tray underneath the branch and tap them onto it and then add to green waste bin. If they are really covering the plant or covering a climbing rose, spraying maybe the only choice, sometimes putting a white sheet underneath and then try and blast them off with a high pressure blast of water and stamp on what falls down or collect into a plastic tub and leave them out for the birds otherwise a spraying with something like provado will kill most of them on the plant, try and spray first thing in the morning or last thing at night to avoid other insects. This is always a last resort for me. I prefer to use as little insecticides as possible. 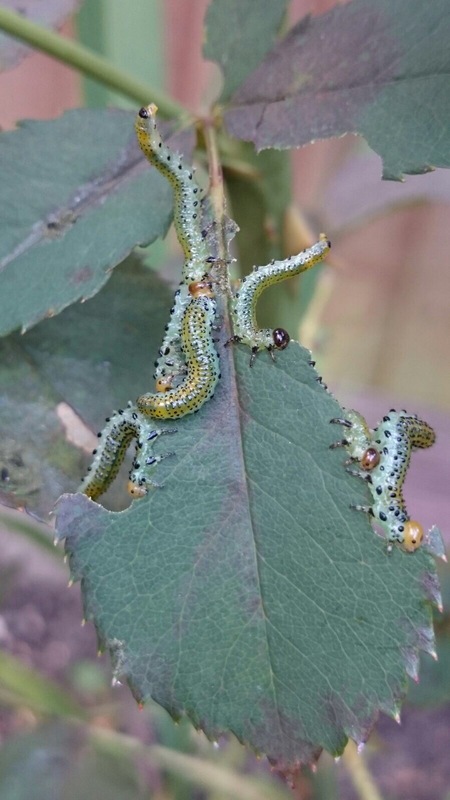 Anyway just watch out for these little beasties on your roses before they strip them of most their leaves! I may have actual nightmares about that. So far I haven’t encountered rose sawfly but I did have an outbreak of berberis sawfly last year. Between noticing what I thought was a bit of die back late one evening and getting the chance to examine it properly the following evening they’d stripped 5 metres of hedge bare! I’ll be setting up an intruder alarm for the rose ones! A real horror movie indeed, Tom! I’ve had plenty of encounters with the leaf-curling sawfly, but not this bigger beggar! Perhaps they haven’t made it in my corner of Hampshire yet. I hope that it stay’s that way. Roses have enough to cope with as it is! Have you noticed if they fall prey to any of our feathered friends? They look quite succulent! Anyway, thanks for the Post. I’ll be keeping an eye open for these little horrors! I haven’t seen these- yet! I’ll be looking out for the little blighters. Thanks for the info and the excellent photos, which will help with identification if I see any.